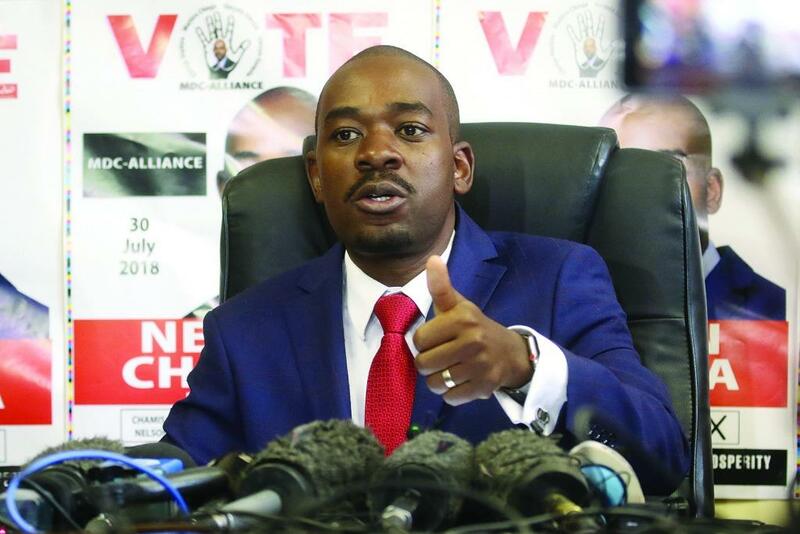 WITH just five months to go to a crucial congress, MDC leader Nelson Chamisa and his main internal rival, secretary-general Douglas Mwonzora, are trading blows in an unpredictable, bruising fight to win the heart and soul of the country's main opposition party. Fresh from a solid perfomance in recent elections, Chamisa appears to bank on a streamrolling campaign strategy coupled with charismatic oratory skills, while Mwonzora seems determined to match his rival's charisma and rhetoric. At the 2014 congress, Mwonzora dramatically upstaged Chamisa to win the secretary-general's position despite having played second fiddle during the preceding nomination process. Many in the party were however quick to point out that he was a beneficiary of the late MDC founding president Morgan Tsvangirai's benevolence. At the time, they insist, Tsvangirai was intent on thwarting Chamisa's rise, viewing him as a potent threat to his grip on the opposition. The highly contentious appointments brought in former rebel MDC secretary-general Welshman Ncube as vice-president and his equally rebellious successor Tendai Biti, who is now the new-look party's deputy national chairperson. Chamisa also promoted Morgen Komichi to the vice-presidency, replacing him with Thabitha Khumalo as national party chairperson. Jacob Mafume, Biti's acolyte, became the party's national spokesperson. "The president came to the NC meeting with a mission to integrate Biti and Ncube into the MDC. He did not say at what levels. The council gave him permission, thinking they would get junior positions. A week later, he just informed the council that he was allocating them executive posts and people were taken aback," a senior MDC official said. "In fact, Mwonzora protested against the decision, saying it was unconstitutional. The party's constitution stipulates that only the National Council can make those decisions and not an individual. But the president insisted that he has power to do so. He did not want further debate on the issue despite a few disagreements coming from committee members James Makore and Costa Machingauta," the source said. "We helped him rise to succeed Tsvangirai to the extent that some even used their money to fund the campaign, yet he even tried to block them from being MPs. For instance, some members of the vanguard (a militant youth organisation affiliated to the MDC) have now defected to Mwonzora," one source said. Sources also said deadly Zanu-PF-style tribal politics were at play in the party, with massive disgruntlement percolating the party's three Mashonaland provinces as well as Manicaland province amid complaints that Chamisa's appointments appeared to favour his home province, Masvingo. Two of the three vice-presidents, Mudzuri and Komichi, come from Masvingo.Even in Matabeleland region, Ncube was not a popular choice for the vice-presidency. He is set to be challenged at congress by Gwanda businessman Bheki Sibanda and former Magwegwe legislator Felix Magalela Mafa, who are being touted as hot favourites ahead of the MDC founding secretary-general. Gift Chimanikire, who is being seconded by Mashonaland Central province, will contest for the other vice-president's position. The three are reportedly aggrieved by Chamisa's handling of affairs. Chamisa is however thought to favour Harare central MP Murisi Zwizwai, who is already being addressed as vice-president in MDC circles, according to sources. Tuesday's executive appointments are also understood to have greatly irked the MDC women's assembly amid reports its members are complaining about the lack of gender balance. "It had earlier been thought either Paurina Mpariwa (currently deputy secretary-general) or Makone would be appointed but the president turned them down and this has triggered bitter disagreements from the women," one senior MDC official said. Mwonzora's camp is also thought to be lining up Gweru lawyer and legislator Brian Dube to challenge Mafume as party spokesperson while Binga South MP Joel Gabuza has reportedly expressed interest in the same position together with Chamisa's chief election agent in the July 30 general elections, Jameson Timba. The battle for the women's assembly is set to be fought among Margaret Matienga, Spiwe Banda, Lillian Timveos — all squaring up against the incumbent Lynette Kore. In Harare, Glen Norah legislator Wellington Chikombo — who was Chamisa's campaign manager during the ill-fated 2014 congress — is reportedly being groomed to take over from Eric Murayi. Insiders believe Murayi is being punished for supporting Mwonzora at the 2014 congress. "In Manicaland province, Chamisa is putting forward his friend Prosper Mutsenyami (Mutasa North MP) to challenge the current chair David Chimhini while James Gumbi has also been targeted in Masvingo province. There is a little headache there because the overwhelming favourite is Bernard Chiwondegwa who has no favour with the president. So the idea is to purge all provincial chairpersons, including Gift Banda of Bulawayo; Sidwell Banda of Midlands North; Piniel Denga of Mashonaland East. It is a total bloodbath," a high-ranking MDC official said. "I do not discuss party issues with the Press, please go back to the people who gave you such information or talk to the party's spokesman," he said. Mafume, the spokesperson, said: "It is true that we are having our congress in the next five months. Basically, we have a specific timeline to follow which would take us eight months, but the party constitution allows us to forego some of those issues and bring the congress a little bit forward. So that is what we are exploring. However, I am not aware of any squabbles taking place in the party. As far as I am concerned, plans are progressing on well." Chamisa's spokesperson Nkululeko Sibanda would not comment, saying doing so would be like "giving relevance to malicious allegations".